dbclunie: 3D Printing : Burning Man 2014 Edition! 3D Printing : Burning Man 2014 Edition! 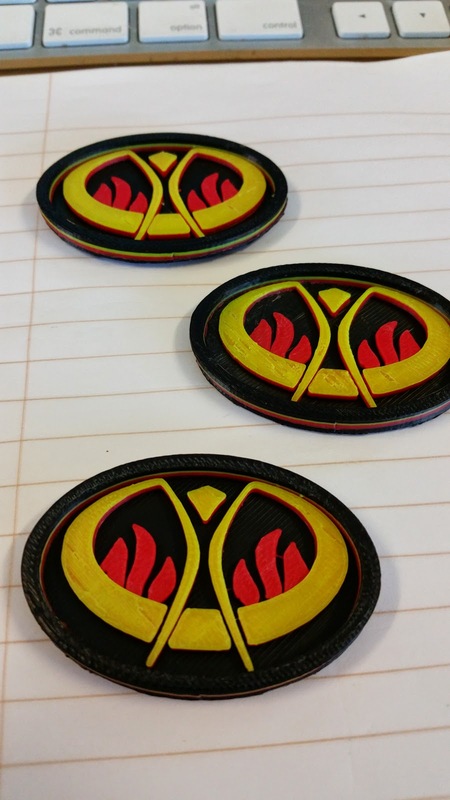 So last year a friend of mine / co-worker, who is a die hard Burning Man attendee, decided he wanted to give out something at burning man to individuals whom he either wanted to "barter with" or just thought that they were some cool people. My friend knew of my purchase of a 3d printer and he inquired about the ability to possibly develop some pendants to wear with minimal cost to mass produce. So I indicated we could use the 3d printer to produce a small run of objects then he could go about casting them in silicone and then in resin. So we did exactly just that. With the help of Taps Plastics (a local store where you can pic up the silcone casting materials and casting resin) Well I printed out about 20 or so "master copies" of a necklace or pendant. We then used some platinum silicone, mainly for its speed in curing, and then he spent the weeks leading up to burning man casting copies of the masters in a white resin. After my friend then went about painting them in various colors and placing them on lanyards of various colors and materials. From what was told to me was that He had cast about 100 or so, and ended up handing out about 60 or so. So over the last week I've spent my free time printing out the new pendant, its fairly simple and I only used one print head and use the z-axis stop on the makerbot to change out colors. the initial design was just a flat .jpg/.png and I used my 3d application, cinema4d( version 7 that I had purchased years ago) to add some depth for each "layer" then extruded those layers to match 1mm increments to make color changing easier because that is what the makerbot uses, mm instead of actual layers to pause at the z-axis. 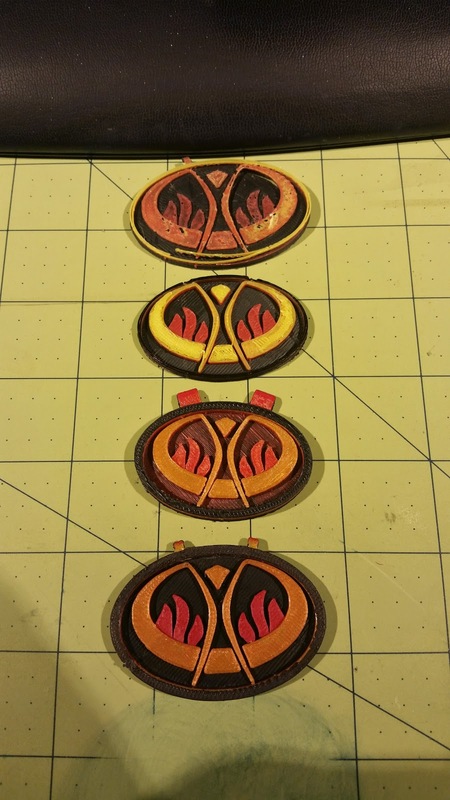 So The base layer was 2mm, the flames were 1mm, the burning man was 2 mm, and the final black was 1 mm for a total of 6mm in height or depth however you want to look at it.